You’ve heard of Craigslist.com, a website where users can post online classifieds for unwanted items, help wanted, and even to search for dates. These posts are visible to thousands of people post their items for sale, help wanted, or even go to search for a date. Sometimes craigslist can help you find an affordable apartment to rent, or an awesome antique table. But, there are also hundreds of stories of people who have been the victim of scams and false advertising. You might be surprised to learn that there are hundreds of used planes listed on craigslist! And you’re probably thinking: “Would someone really look for such a valuable asset on a website whose history is so controversial?” We took a look into the world of buying an aircraft on Craigslist and decided to share the results with our visitors, so that they can stay informed. . If possible, purchasers should seek out a purchase agreement in order to protect both parties. Unlike most aircraft sales websites – take Controller for example, there is no real filter as to what aircraft related items can be posted on Criagslist. So, most searches simply lead to listings of aircraft parts, advertisements for flight schools, and plane owners offering a “time-share” type deal. All of these mentioned can be good opportunities, and you just might find the part you need to fix up your plane, or an affordable flight school to hone your skills. Craigslist also happens to be the cheapest option for listing your aircraft, because there are no listing fees or cuts taken from your profits. However, if you’re selling an aircraft from a dealership, some fees do apply but its a measly $5 per listing, so still incredibly affordable. On top of that, you’re able to instantly reach a massive audience with this Craigslist due to its extreme popularity. The most difficult aspect of searching for an aircraft for sale on Craigslist is the built in organization of the site. Instead of simply searching “aircraft for sale” and seeing all aircraft listed on the site, you can only search for specific areas. Most major cities and counties are included, but having to search through pages and pages of these just to find the aircraft in the first place can be pretty confusing and overwhelming. Craigslists original appeal was that you’re buying used items from people in your local community, but the very nature of aircraft and aviation allows for cross country or even international deals. This isn’t a problem on other aircraft for sale sites, because the planes are typically listed by make and model, and very rarely by location. Something to keep in mind when listing or purchasing an aircraft on Craigslist is that the website has absolutely no control over the transaction itself. They don’t guarantee purchases, process payments securely and they definitely do not verify any sellers. So if you run into a scam or just something sketchy, there is almost a 100% chance Craigslist will not be liable. During our search for this article, we did find a pretty interesting story about someone who was trying to sell a Cessna 172H on Craigslist – one catch… the airplane was upside down on the ground. 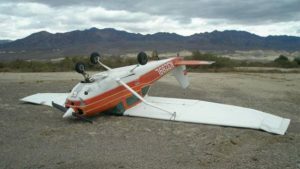 The owner claimed that the plane had gotten flipped when a tornado came through town. However the owner was still asking $16,500 for the “68 Cessna. Since then, it has been flipped upright and sold so a lucky buyer, but the article is still a funny read! Another notable find is this Corvette-Mooney Frankenstein that was hand made in the owners backyard. 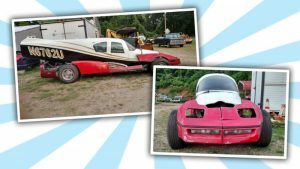 He put the fuselage of a 1963 Mooney on the frame of a 1984 Corvette, and created a terrifying hybrid that is definitely not up to inspection. The worse part? He didn’t even attempt to match paint schemes. We really hope that this is the sellers idea of a joke or an art project, but either way… it has to be seen to be believed. Like we said early, there are hundreds of pre-owned aricraft available on Craigslist. However, the may not all be gems but it is possible to find something worthwhile. However, based on everything that we found – you’re better off sticking with Norfolk Aviation to buy or sell your aircraft. Our staff is 100% devoted to getting you the aircraft you want for a price you can handle! And if you’re planning on selling your aircraft – we’ll list it, show it and close the deal! Call us at 757-724-6047 today to find out what Norfolk Aviation can do for you!